Some folks resort to sending their packages to their work. A few weeks ago, I got an email about an electronic locker system called Package Concierge that is installed at apartment and condo buildings to manage, track and secure packages and other mail delivered to buildings. That seemed interesting to me, so I asked more about it. The folks at the Allegro on 14th Street, where it's installed, answered a few questions. Can you talk about how this system works? Package Concierge is a technology-based system that uses sophisticated software to operate the digital kiosk, as well as an RFID reader to control locker access and a barcode scanner to read package tracking information. The system also includes online portals for both residents and management to view activity and manage accounts. Despite all this technology, the process to deliver and retrieve a package is simple. A carrier scans his badge at the kiosk and selects the resident’s name and then places the package in the correct size locker. The resident then receives notification via text or email that a package is ready for retrieval. They can retrieve their package at any time 24/7 knowing it is safely stored in the Package Concierge. Is it new? Is it for any kind of mail? What kind of space does it require? Package Concierge launched its first system in Washington, D.C. in November 2013, and is being adopted in multifamily communities across the country. The system is specifically designed to handle packages versus standard mail, but accepts deliveries from USPS, UPS, FedEx and every other carrier. The system is modular and highly flexible; a property can configure a “U” or “L” shape or even a split system. System size varies based on the physical footprint of the property, the number of units and average number of packages handled. A small property can start with a five-tower system that includes 34 lockers and is approximately seven feet in length. Why did The Allegro choose this kind of system? The Allegro is an 297 unit luxury apartment community. The property has a full-time concierge, but has a challenge handling larger and oversized packages behind the concierge desk area. The Allegro purchased a system with medium-sized lockers to handle these particular packages. The concierge loads excess packages into the system on a frequent basis and reports that residents love the convenience and ease of use. Can homeowners subscribe to it, or is it more for apartment buildings? 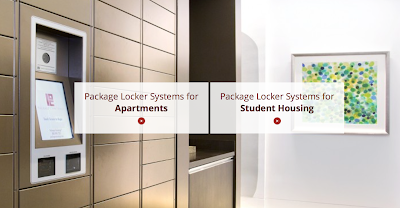 Package Concierge is specifically designed to serve the unique needs of multifamily and student housing communities. The apartment ownership pays for the system to be installed as well as a monthly software or maintenance fee. Some properties will charge an amenity fee to residents to use the system, typically a nominal annual fee. Where else is the system used? There are currently more than 25 apartment communities using the Package Concierge system in the D.C. area and more than 150 across the country. I live in the Allegro. The Package Concierge is a pain in the neck to get packages out of --- you have to remember a username they assign you plus a pin and it makes horrible sounds while it waits for you to close the door to where the package is hidden behind. Fortunately, at Allegro they still just hold most packages at the front desk. Hi Jason. I work for Package Concierge and we are always grateful for the feedback on our system. I wanted to let you know that the Concierge staff at the property can configure the key fob that you already use at the property. When this is done, you will never have to manually type in your user name again. The PIN code is included as an extra layer of security on your account. Since residents set this up for themselves, it hopefully is easy to remember. We can also assist in resetting when needed. I am going to stop by the property to check the beeper. This is supposed to be set at the lowest level upon installation. So I will be sure to check that out and lower the volume if needed. The property management staff has my contact information so feel free to reach out to me directly if you would like to provide any more feedback. I would be happy to meet you at the property as well to configure your key fob and/or assist in making the system more of a convenience for you.